Want to homeschool but don't know where you will put everything? Have space for storage but the budget is too tight for all those fancy shelves and other IKEA organizational items I spend hours drooling over? By upcycling things you already have and using a little creativity, you may find more storage places and things your can repurpose for your homeschooling adventures than you thought possible. To help get you started without breaking the bank, I put together a list of 10 frugal ways to store your homeschool materials! Two of the most common reasons I hear people say they can't homeschool is “We don't have a room for school” and “We can't afford to homeschool” A dedicated school room is great, but not necessary. When we started homeschooling, homeschooling was done at the dining table and our materials were stashed on a bookshelf and in random places around the house. Since then, I've managed to slowly remodel rooms in our house and create a dedicated school room. Although, the boys still prefer to do school at the table and, honestly, so do I! Even though we have more space and a bigger budget than we did in those early days, I'm still all about saving a dollar whenever possible! 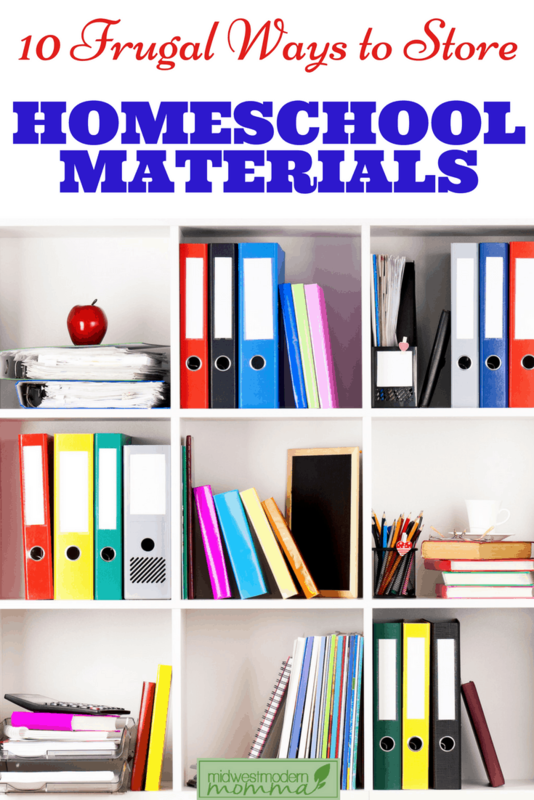 These 10 frugal ways to store homeschool materials will help you get organized and free up a little of your budget for more curriculum! What are some of your favorite homeschool storage solutions? We are in the process of selling and moving to a new home. Right now, we have a 9×9 room for 3 kids and myself – I am a homeschool support teacher. So it gets a bit cramped. I am starting to gather ideas for a newer, larger area to work in, so your list of storage ideas, etc will be most helpful. I am pinning!